Le bonheur est dans la feuille et pas dans le pré ! Makes the day brighter, right away! Whenever we travel to France, P.’s love for boulangeries grows bigger and bigger. I thought that the phenomenon would start to fade away with the years, but non, mais pas du tout ! (Not at all!) I can still remember the first time when he and I were wandering along the streets of Metz. He could not stop running to every single boulangerie window he saw, almost clapping in his hands, keen and impatient to try everything nos amis les boulangers were selling. To tell the truth, this behavior made me a little concerned and nerveuse at the time since, despite the fact that P. never seems to put weight on whatever he eats, at that point, I really thought that he was going to transform himself in a big fat croissant. Énorme ! Thank God that this never happened in spite of the daily pains aux raisins which he happily kept eating every morning during our stays. My mum, who is quite an observer — or is it that easy to spot his weakness? — , had very quickly noticed her gendre‘s (son-in-law) strong attraction to viennoiseries en tout genre and so, every morning, she would sneak out to walk to the village bakery in order to buy une schneck for Monsieur (’cause this is really what we call them in my Lorraine), so that he would wake up and walk to the kitchen table to find them for breakfast. What a treat that was! Until recently, I had not tried my hand at making croissants. But I have eaten many croissants in my life. Good and not so good. Normal. I am not yet sure how and why this fell on me, but yesterday, I suddenly decided that I wanted to make Monsieur happy with some viennoiseries. Far from being perfect in shape — mind you, this was my first time and with every first time, the good news is that there is a lot of room for improvement — , the taste however was really worth the efforts put in it. 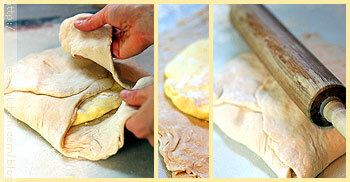 Making croissants is not particularly difficult once you understand the steps, it just takes time! 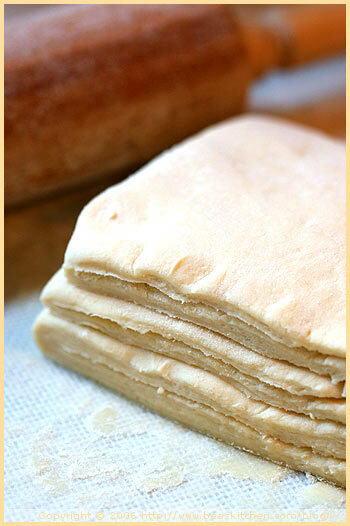 The process involved into making croissant dough is very similar to the one followed for puff pastry. 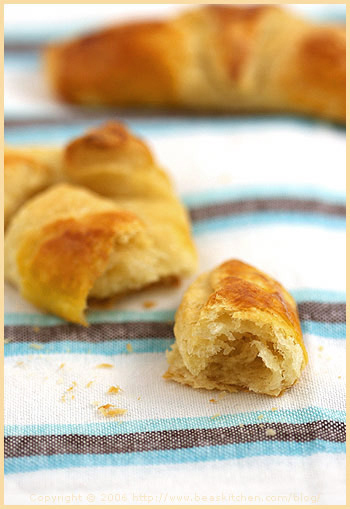 Alternating layers of dough give these delicate sweet treats their wonderful flaky texture. Une belle pâte feuilletée. To achieve this successful result, you only need to follow patterns and repeat them. Folding croissant dough is actually similar to what you do when closing a book; one, two, three times minimum in order to make it flaky. The recipe I used to make my croissants comes from Leslie Mackie’s lovely Macrina Bakery and Café Cookbook recently bought while in Seattle. Although I did not try the bakery’s croissants while there, if only thinking about what I tasted, I would bet that they were as good as they looked. Oven temperature 380 F. Ready? It only takes 15 to 20 mns to cook them. Rising slowly but surely in the oven. Then came the first bite. Playing boulangère d’un jour (Baker of one day), I loved trying my hand at these! Of course, they require time and attention, but if you have time, why not you! Step one was making croissants, step two will be another delicious treat that I will present in a future post. I need a cup of tea now…. Note: I am not sure whether next time I would add the vanilla extract which surprised me when I read about it, but it was good to follow the recipe ingredient list to see how it worked. Heat the milk in a pot until it is warm to the touch (be careful not to overheat it). Pour into a large bowl and sprinkle the yeast on top, then the sugar and vanilla. Mix and leave it to froth for about 5 mn. In a separate bowl, combine 3 cups of flour with the salt, and mix with a wooden spoon (I used my hands). Add the flour mixture to the milk gradually and mix until just combined. Cover the dough with a plastic wrap and refrigerate it overnight (or for 8 hours). It should almost double in size while in the fridge. Take the pre-dough out of the refrigerator. Cut the chilled butter into 12 equal pieces and mix it with 3 Tbsp of flour until the butter is completely smooth (use a stand mixer if you have one, with paddle attachment). Scoop the butter mixture onto a well-floured surface and shape it into a 6″square (about one inch thick). This becomes your butter block. Place it in plastic wrap and refrigerate. On a well-floured surface, pat the pre-dough into a square. Stretch each corner outwards about 4″ making an X shape. Place the butter block in the middle and fold the stretched corners of the dough over the butter block. Pinch the seams together to completely seal the butter inside the dough. Sprinkle the dough with some flour and roll the dough into a 12 x 20″ rectangle. If the butter shows in places, pinch the dough to reseal it. Place the longer side of the rectangle in front of you and fold the left and right sides to the center so that they meet. Then, turn your dough at a 90 degree angle and fold the left side of the dough to the middle, then the right side over it, as if closing a book. Put the dough in plastic wrap and place it in the fridge for 30 mns. Take it out of the fridge and leave it at room temperature for 15 mns. Repeat the folding process two more times (roll into a rectangle, fold the two sides to the center, fold as if to close a book, chill). Once the 3 foldings are done, chill the dough one last time for 30 mns. Cut your dough in two halves and roll one half into a rectangle (place the other half back in the fridge in the meantime, for more croissants or another treat which I will present later on). Cut triangles in the rectangle and make a small slit at the base of the triangle. Roll starting from the base of the rectangle to the tip. 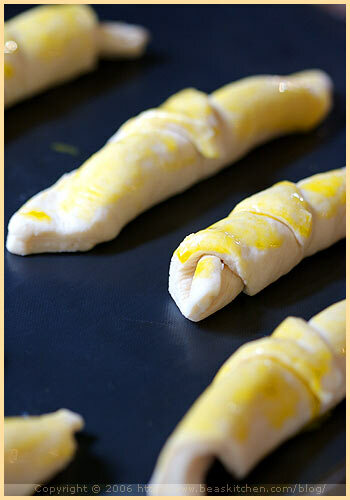 Brush the croissants with one beaten egg yolk and let rest for 2 hours minimum in a warm room (70 F minimum). Preheat your oven at 380 F. Cook the croissants for about 20 mns, or until they have a nice golden color. Enjoy immediately! Faites chauffer le lait dans une casserole jusqu’il soit chaud au toucher (ne le faites pas bouillir). Versez-le dans un grand bol et saupoudrez la levure dessus, puis ajoutez le sucre et la vanille. Mélangez et laissez de côté pendant 5 mns. Dans un autre bol, combinez les 375 g de farine avec le sel et mélangez avec une cuiller en bois (J’ai utilisé mes mains). Ajoutez petit à petit la préparation de farine au lait et mélangez, sans trop travailler la pâte. Couvrez la pâte avec du film étirable et mettez-la au frigo toute la nuit ( ou au minimum 8 heures). Elle doit presque doubler de taille au frigo. Sortez la détrempe du frigo. Coupez le beurre froid en 12 morceaux de taille égale et mélangez-le à 3 càs de farine (utilisez un robot si vous en avez un). Mettez le beurre sur une surface bien fariné et formez un carré de 15 cm (2,5 cm d’épaisseur environ). C’est votre bloc de beurre. Emballez-le dans du film étirable et mettez-le au frigo. Sur une surface bien farinée, travaillez la détrempe pour former un carré. Étirez-la et donnez-lui la forme d’un X en tirant sur chaque coin vers l’extérieur de 10 cm. Placez le bloc de beurre au milieu et recouvrez-le avec les coins de pâte étirés. Fermez les “coutures” pour couvrir tout le beurre. Saupoudrez de farine et étalez la pâte pour former un rectangle de 30 x 50 cm. Si le beurre est visible à certains endroits, recouvrez-le à nouveau. Placez la partie longue de votre rectangle face à vous et repliez les côtés gauche et droit pour qu’ils se rejoignent au milieu. Puis, tournez la pâte de 90 degrés (on appelle cela un tour) et pliez le côté gauche et le côté droit comme si vous fermiez un livre à chaque fois. Emballez-la dans du film étirable et mettez-la au frigo pendant 30 mns. Sortez la pâte du frigo et laissez-la à température ambiante pendant 15 mns avant de recommencer la même opération, deux fois encore (étalez-la en forme de rectangle, pliez les deux côtés au centre, donnez un tour et pliez-la avant de la remettre au frigo). Une fois les 3 tours terminés, remettez la pâte au frigo pendant 30 mns. Remarque: cette partie n’est pas incluse dans la recette dont je me suis inspirée. Ce sont mes notes. Coupez la pâte en deux et étalez une moitié en forme de rectangle (remettez l’autre partie au frigo pour une autre fournée de croissants, ou un autre usage que je vous présenterai bientôt). Découpez des triangles réguliers dans le rectangle. Faitez une incision au milieu de la base de chaque triangle, et rouler votre pâte en commençant par la base en direction de la partie pointue. Badigeonnez chaque croissant d’un jaune d’oeuf battu et laissez-les lever pendant deux heures, minimum dans une pièce chaude (20 C minimum). Préchauffez votre four à 190 C. Cuisez les croissants pendant environ 20 mns, ou jusqu’à ce qu’ils aient une belle couleur dorée. Dégustez sans attendre! Ohh Merci Béa!! Croissant! Yum! hey have a great weekend ahead bea! I had to make these when I went to school but to be honest, I would rather buy them than make them 🙂 Same with puff pastry too! Yours do look yummy though. 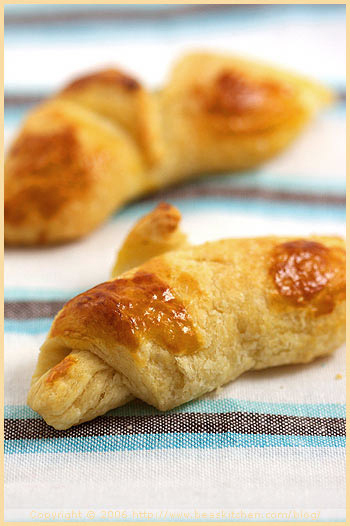 Congrats on getting over your fear of croissants – they look gorgeous! I have to say I’ve developed some serious muscles making croissants every week – are you going to be taking up the workout too? I am still terrified of croissants but thanks for showing that it isn’t as daunting as it looks. Et je suis d’accord avec toi pour la vanille: je trouve l’idée exotique mais bizarre dans une pâte à croissants! You clever brave woman. I might try making them this week if I have the time. Ohhhh and my diet has been going so well. Golden, warm croissants..I can almost smell their buttery scent coming from the oven. Sweet story too 🙂 I wish I knew why the French call these “viennoiseries” I bet nothing comes close in Vienna..
Oh, it’s really beautiful. I know many english or american who love croissants …. ben moi, le côté plein de beurre me tente bien ;-)!!! et la phrase mise sous l’une des premières photos me parle!! je suis fascinée par tous ces petits croissants fort alléchants! Qu’ils sont beaux!!!! ça me tue d’aussi belles photos! Comment fais-tu??!!!!! Hum j’adore, je crois que je vais craquer, tu nous fais quelques pains au chocolat aussi? Quelles photos, encore plus miam. Yum, yum, yum! Can we make pains aux chocolat next? S’il vous plait? Your first time is a pretty good job Bea! 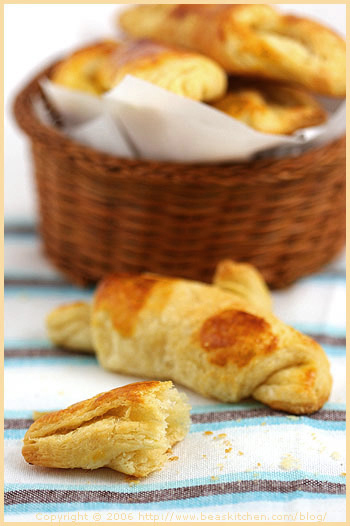 Every year when the winter approaches, I always have a crave for this buttery and flaky pastry! Yours are lovely! And our camera batteries should die even faster, so many breath-taking scenes to capture! 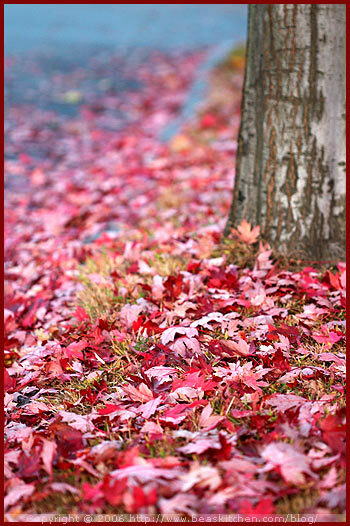 Oh gosh, your maple trees look like sprinkling gold dust, gorgeous!!! mmmh, trop bon … mes premiers essais croissantuesques étaient une catastrophe culinaire, mais j’essaierai ta recette en espérant un meilleur résultat. I want some Nutella with mine!! Damn, another recipe that I will have to try, especially because it involves butter. I remember watching Jacques Pépin make this, on a PBS show, years ago. Just gorgeous!! Oh how I wish I could pop one in my mouth! I love your step-by-step instructions. 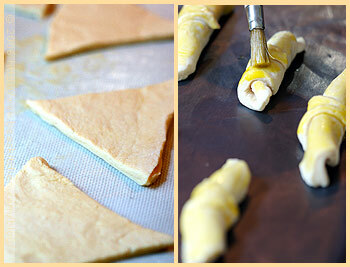 well, I am still scared of croissants… making my own, that is! although I now see it on yours and have seen it on delicious:days, I am still not convinced that this is for me! anything involving a rolling pin and hours of work scares the hell out of me. i’d rather stick to my tried and trusted PAUL and other good bakeries (of which there aren’t many)… but well done, you! The step by step pictures were really great in this post. These are beautiful croissants – although I’m still not sure I’m brave enough to venture into baking croissants. And on another note, your fall leave photos are absolutely *beautiful*. Amazing photography! when you take the butter out of the fridge isn’t it too hard to roll? do you let it warm up a bit first? Ce’st magnifique! These bring back memories of not only trips to Paris, but then coming back to then NYC where I lived and indulging in these at a great French bakery on the upper east side. Thanks for the details, since I’ll try these and could become a new regular for our b&b guests. Ah yes, I should have left them proof longer! Patience is not a quality of mine! Anita, merci! Yes I guess you develop muscles in the kitchen for sure! Jenjen, I am sure you would be great at doing croissants, you have baking skills for sure! Avital, ah merci, je note cette recette. C’était ma première fois, donc je n’avais pas de référence! Je suis déjà impatiente de l’essayer. Carol, ah yes, the mystery of language…. Fabienne, ah yes croissants are sacred! Texmex, je devrais essayer, tu as raison. Prochain projet. Christine, ah yes, des pains au chocolat are a great idea too. 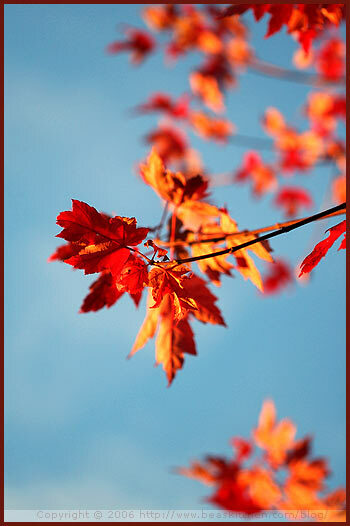 ANd yes the leaves are absolutely gorgeous here! So vividly colored. Gattina, thanks. Yes winter is good for those goodies. Michel, AH this show must have been fun! Julie, thank you! I am glad you like the step by step with pics. Natalie, thank you! I am sure you would be great at making them. China, the butter is cold but then you work it using your stand mixer, so it gets softer to make the butter block, but should not be too soft either. GP, thanks for stopping by! I bet this bakery in NYC must have been a gem. Je n’ai jamais ose, mais j’imagine la premiere bouchee de ses propres croissants, ca doit etre un tel plaisir! Wow! What and inspiration. 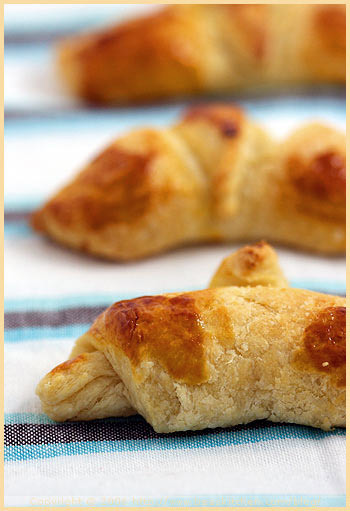 I must try these…they look so delicious and the thought of them fresh from the oven…yum, yum. One of my favorite doughs!! Bravo Bea! I adore this post ! Beautiful ! This post has definitely inspired me. they look really good and delicious but i have a different recipe which you should try out! This is officially my favourite post today!!! Be prepared to experiment with at least a dozen batches before you even get close to a real croissant. Excellent post. I made my first batch of croissants yesterday, time consuming but so worth it. Write up can be found on my blog. they turn out when they finally hit the oven!!! lám interested of leaning how to make croissants ? Thank you so much for these fabulous instructions, I set myself a challenge to make pain au chocolat, and found these guide lines the best to work from for the pastry and have linked them through to my blog so others can benefit from them. Very nice to share. Precise yet simple instructions. I am sharing this with my T~Margie I feel she will enjoy along with her family. What a lovely aroma to wake to(next to the aroma of brewing coffee).thank you for sharing.